Goldilocks Cake Plant Tour (Part 2)! 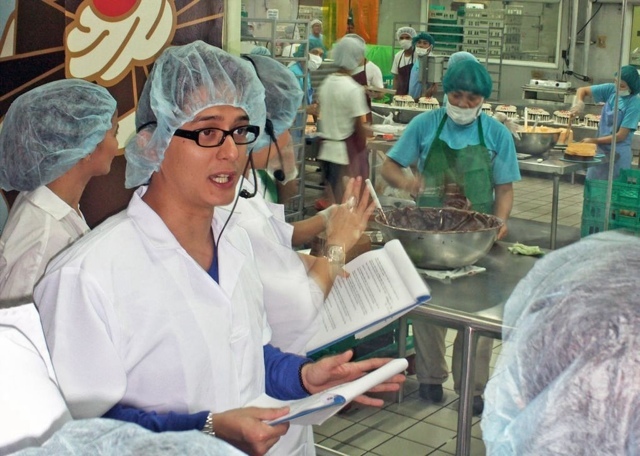 The cake plant tour held at the Goldilocks headquarters along Shaw Blvd., were hosted by Goldilocks celebrity couple endorsers, Ryan and Judy Ann Santos-Agoncillo. 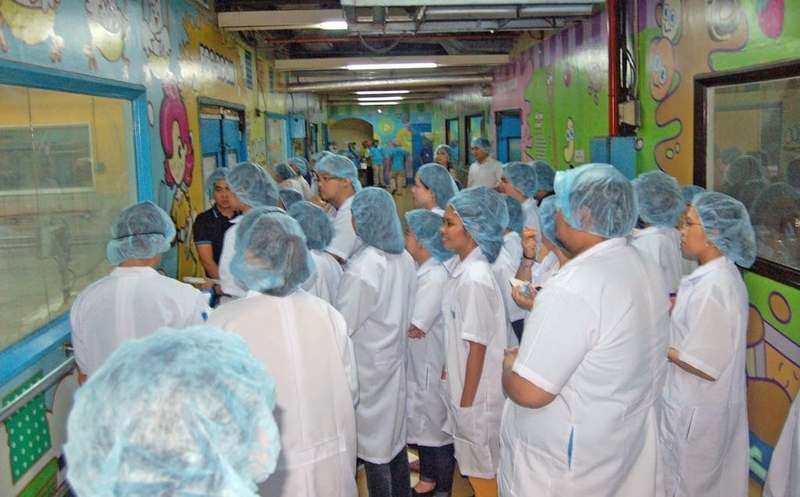 But before we were able to enter the cake plant, we were all given hair nets and lab gowns (like what the couple are wearing) to make sure we won’t contaminate anything. Even our personal belongings were left behind and guarded by the kind staff of Goldilocks. As promised, here are the official pictures taken during the “Goldilocks Cake City Experience” held at the Goldilocks Headquarters with the Agoncillo couple leading the way. The headquarters in Shaw Blvd., Mandaluyong services the Metro Manila area alone with production operating 24/7. The cake plant tour started at the Egg Room. They use 200,000 eggs each day or 5,400,000 eggs per year. Woah! Goldilocks produces 8,000 premium cakes per day and 4,400,000 cake rolls per year that can form a line from Tawi-Tawi to Taiwan! Imagine that…! Next stop was the Filling Room where they whip their own “G Cream” and make their own “G Butter” (“G” stands for Goldilocks, in case you didn’t get it.). These are all blended with regular flavors to create that signature Goldilocks taste. We were also led to the Frosting Room where all kinds of icing are made. I love Goldilocks icing (just saying… Haha!). 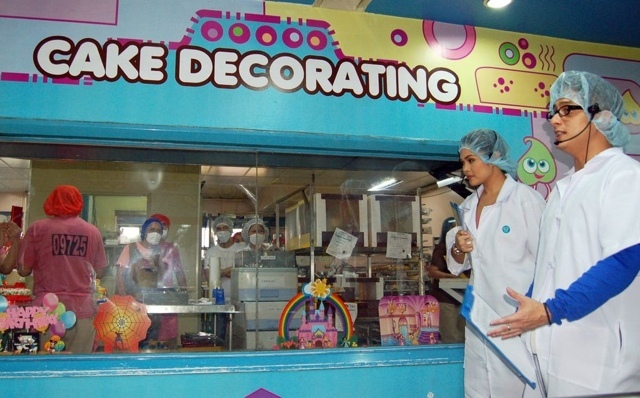 Next on our list – the Cake Decorating Room where the Celebration Cakes are whipped up. That’s why they have QA officers to check the products, plus a quality lab to check raw items before sorting them out to ensure they put out first class products. So, before you take a delicious bite out of your cake, remember how much time, love, attention and dedication these wonderful people put in so you could enjoy top quality Goldilocks goodness every single time. And THAT, my dear Tummy Travelers, gets my two thumbs up any day of the year. Book your Goldilocks Cake City Tour now and have that Goldi-good experience soon! *all photos featured above are courtesy of Goldilocks. It’s nice to see Judy Ann and Ryan doing the plant tour. i have thing kwento with one of my friends experience about her Goldilocks birthday cake two weeks ago. So her husband bought a birthday cake at Goldilocks Magsaysay Drive here in Olongapo City. So when they opened the box and will unload the birthday cake they saw a dead cockroach. Seems to me its already dead i just hope it is. They returned the cake and made a refund… im not sure whose responsible about the incident just wish it didn’t happened. Would it be ok if I can share to you a photo of the cake? Goldilocks Cake Plant Tour (Part 1)! You are Here >> Home » Events » Goldilocks Cake Plant Tour (Part 2)!